The Need for a Sense of Identity Beyond the basic need for a sense of control, we are deeply driven by our sense of identity, of who we are. We are in the middle of our individual world, where we place central importance on our sense of individual self. As Descartes said, ‘I think, therefore I am.’ Many social theories are to do with creating or preserving our sense of identity. 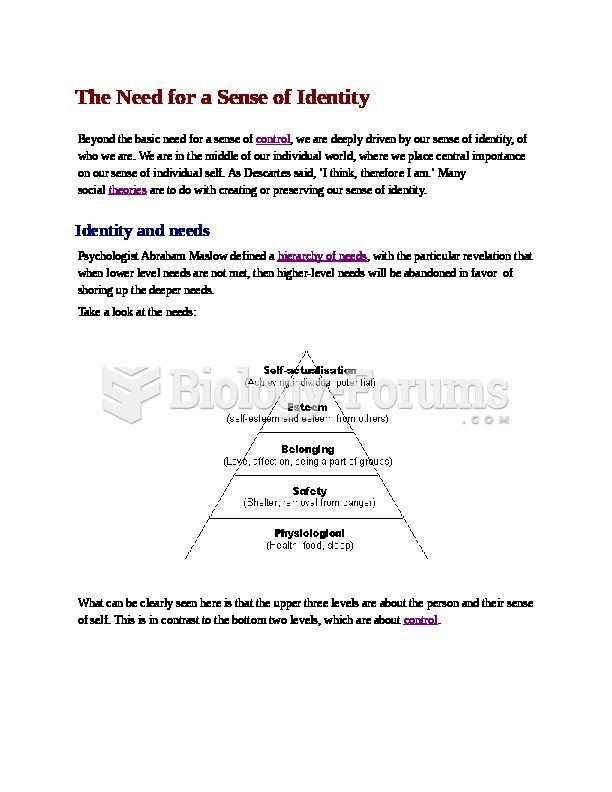 Identity and needs Psychologist Abraham Maslow defined a hierarchy of needs, with the particular revelation that when lower level needs are not met, then higher-level needs will be abandoned in favor of shoring up the deeper needs. Take a look at the needs: What can be clearly seen here is that the upper three levels are about the person and their sense of self. This is in contrast to the bottom two levels, which are about control. Identity formation The sense of identity appears early on in life as the infant begins to separate themselves from an undifferentiated unity with their mother. A mirror image of themselves can provide the sudden shock of realizing that they are separate beings. Young children typically cling to a single teddy bear or doll, through which they know their own identity (I am not my teddy). When this ‘transition object,’ as psychoanalystDonald Winnicott called it, is removed, a part of their identity is lost, causing distress and tears. This pattern continues through our lives as we identify with our possessions and the things around us and feel bad when they are changed or lost. Individual identity We may, to a lesser or greater degree, define our selves internally, with limited reference to others. Those for who this is a major way of creating identity feel little in common with others. When they are with other people it seems as if those others are somehow taking something of their identity away from them. Group identity We often categorize ourselves in terms of other people and groups. Evolution has taught us that it is beneficial to live in tribes, where we can share out the work of daily survival. When asked about yourself, you may well describe yourself in terms of your work and family relationships: ‘I work for AB Corporation.’ or ‘I am married to Steve and have three children.’ Some people put a greater emphasis on group identity. In effect, their sense of identity is created through taking a part of everyone with who they bond and adding it to their own sense of self. In this way, our self becomes a complex, multiple, social being. If we lost our job, it would not just be the loss of money (affecting our sense of control) that hurt us, but also the loss of relationships and feelings of being outside the company with which we have identified ourselves for so long. The fear of rejection from the groups with which we identify is a powerful force and just the thought of this is enough to dissuade many people from ever taking their creative ability out of the cupboard where they have locked it for fear of its potential social effects. Social comparison Although we define our selves by our membership of groups, we also define ourselves by comparison and contrast with others. If we have more than others, we feel superior. If everyone has the same as us, we feel equal. The size of gaps also matters. If I have a lot more than others, then I probably feel a lot more superior. I may also feel more isolated as I realize that they may feel envious of me. This social comparison often appears in forms of status, which is one reason we are driven to purchase status symbols that signals to others (and particularly to ourselves) that we are better in some way - richer or more tasteful, for example. Social comparison is often along some measure of success, which is itself a social construction. Our sense of identity degrades when we fail - which we often do as we accept constant social escalation of what 'success' means. Identity paradoxes There are several paradoxes we have to navigate in our search for our selves, including: Me vs. Us In order to be allowed to join a group (and hence satisfy belonging and esteem needs), we have to give up prioritizing everything for ourselves and be ready to put the group ahead of our own interests. In doing this, we have to change our sense of identify from always 'me' to thinking about 'us'. This includes taking on group values and beliefs, even if we do not particularly agree with them. Perfect me vs. real me We like to think we're perfect. In fact we're not that great, and regularly break our values (Are you law-abiding? Yes? So when did you last exceed the speed limit? Are you thoughtful and kind? So when did you last criticize a friend?). In practice, we manage to mentally separate these two personas. When they are forced together, we instantly find justification and excuse for our misdemeanors.